Photo 1. Field day highlighting weed management at Rochester, MN. A research team comprised of faculty from Extension, the Research and Outreach Center at Waseca, and the University of Minnesota St. Paul campus conduct field research and demonstration trials annually in southern Minnesota to address local, timely crop production issues. Highlights from the 2016 research report include demonstrating 1) the benefits of using preemergence (PRE) herbicides in corn and soybeans, 2) systems to control giant ragweed and waterhemp, 3) new herbicide technologies used in soybeans, and 4) use of mechanical cultivation for waterhemp control in soybeans. Controlling weeds on the farm may be more of a challenge these days. Perhaps there is more giant ragweed or waterhemp in the fields, or perhaps controlling some of these populations is more difficult and herbicide resistance is suspected. Figure 1. Comparisons of weed control systems in corn that include a robust preemergence herbicide (left) to one that does not (right) at two different dates: May 23 (top) and May 31 (bottom). In just 8 days, the giant ragweed has canopied over the the corn in the no PRE treatment. Photo 2. Weed control on June 13 with Acuron Flexi at 1.12 qt/a PRE-applied April 25 followed by Acuron Flexi at 1.12 qt/a POST applied on 2-inch weeds June 2, 2016. 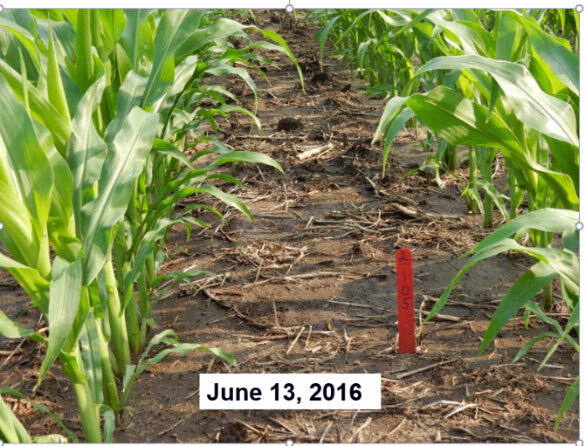 2016 Evaluation of the weed spectrum and duration of control achieved with preemergence applications of Acuron and Acuron Flexi in field corn at Rochester, MN. Figure 2. 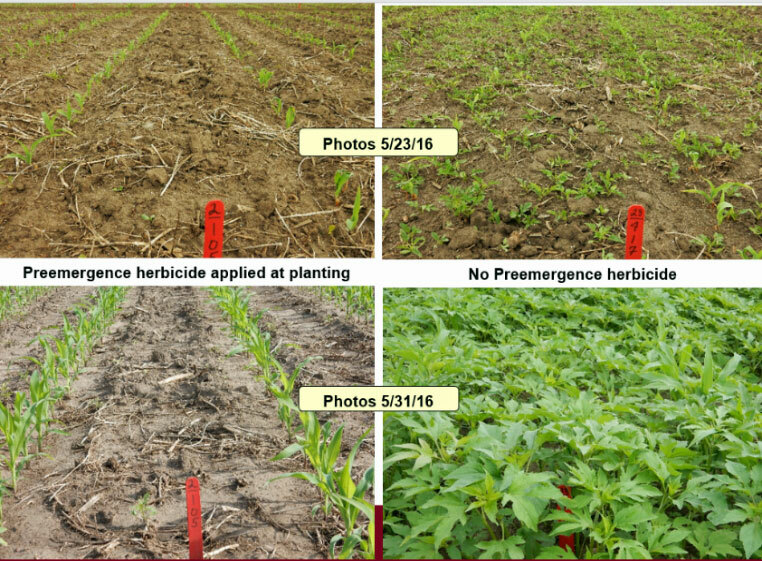 Comparison of weed control with PRE applied herbicide BroadAxe XC to PRE applied Surveil on June 10, 2016 in soybean. Click to enlarge. Figure 2 illustrates how selecting a PRE herbicide affects weed management later in the season. 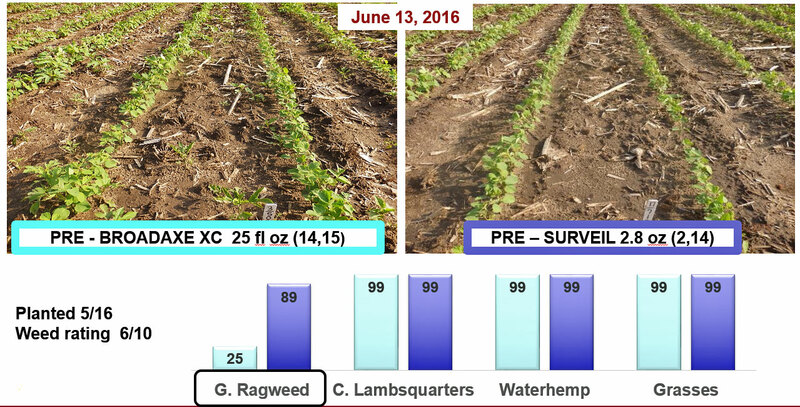 While BroadAxe XC (Group-14,15) provided excellent control of common lambsquarters, waterhemp and grasses, it provided minimal (25%) giant ragweed control compared to the Surveil (Group-2,14), which provided 89% control of giant ragweed (June 10 rating). The additional advantage of the PRE Surveil was to increase flexibility of the POST application timing. In this case, the time or window was extended by almost 2 weeks before the POST program had to be applied. 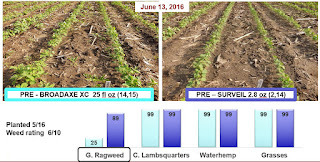 In the other program, BroadAxe XC controlled the major weeds, so giant ragweed was the primary weed the POST herbicide program needed to control. University of Minnesota 2016 statewide soybean weed management at Rochester, MN. 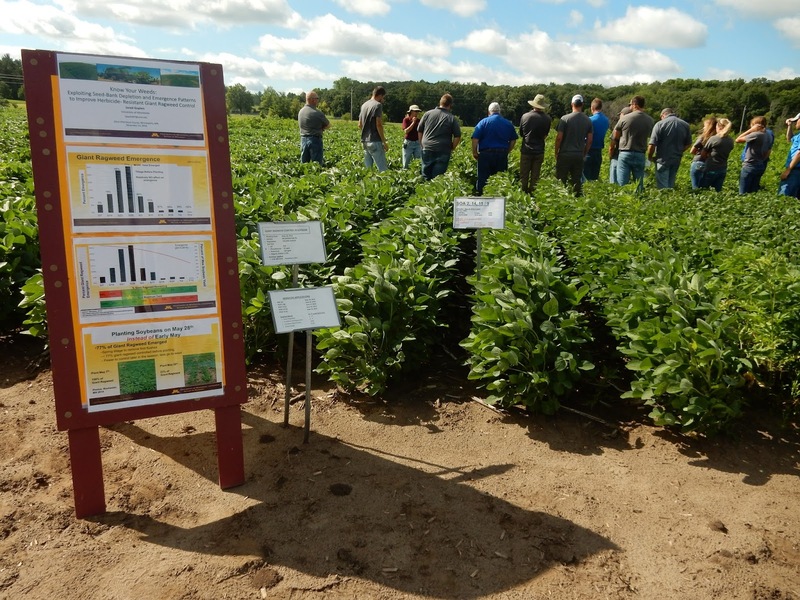 Giant ragweed control in soybean - Demonstration of the advantages of a full spectrum residual herbicide program in soybean at Rochester, Minnesota in 2016. 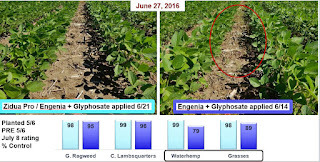 Managing ALS (Group-2) and glyphosate (Group-9) resistant giant ragweed and waterhemp and in some fields, PPO (Group-14) resistant waterhemp in soybean fields poses many challenges. Starting with a good foundation and using technologies other than glyphosate, such as LibertyLink or dicamba tolerant soybeans provides additional postemergence herbicide options. However, to be successful with any of these technologies, it is important to start with a good preemergence herbicide foundation. These PRE herbicides foundations should and can be used in conventional, glyphosate, glufosinate or dicamba soybean systems. It is crucial be good stewards of these technologies. Weed populations are dynamic and problems will continue to escalate unless strategies are developed to address these changes. In the trials at Rochester, many herbicide systems in corn and soybeans are evaluated, including a variety of herbicide-tolerant technologies. Trials in 2016 included soybeans tolerant to Group 10 (glufosinate), Group 4 (dicamba and 2,4-D), and Group 27 (HPPD) herbicides. These technologies bring a different herbicide group to soybeans, but they do not bring a NEW herbicide group to the world of weed control. Since these technologies are currently used in corn and other crops, many weed populations are exposed to the same herbicide group in consecutive years. To confound this, dicamba and 2,4-D herbicides have been used since the 1960s and no new herbicide SOA or Group has been discovered since the 1980s. Industry experts suggest it will take a minimum of 15 years to develop and discover a new SOA. Therefore, it is imperative that these tools and technologies are preserved by being good stewards and implementing non-chemical options to our weed control plans. Figures 3 and 4 demonstrate the value of including a PRE herbicide in a glufosinate and dicamba system. Figure 3. 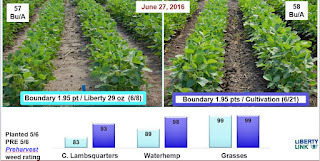 Comparison of weed control programs in LibertyLink soybean. Common lambsquarters control was 98% with Authority First (2,14) (left) and 85% with Verdict + Outlook (14,15 + 15) (right). POST Liberty (10) needed to be applied by 6/8 (right) compared to 6/24. Click to enlarge. Figure 4. Comparison of weed control in dicamba (4) tolerant soybeans with and without the PRE herbicide Zidua Pro (2,14,15). Click to enlarge. 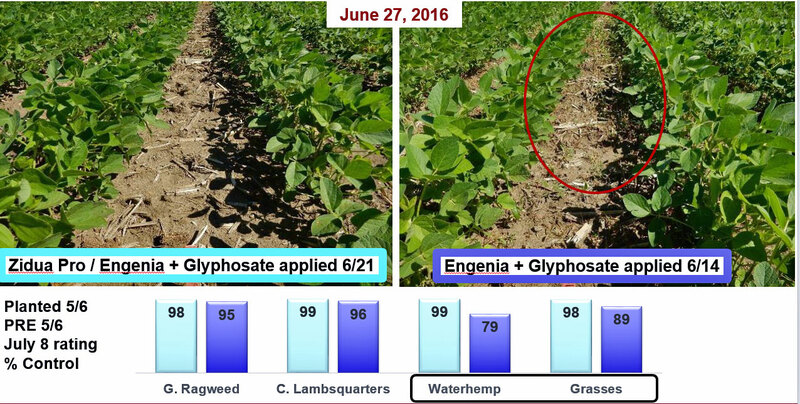 Managing glyphosate (Group-9) and ALS (Group-2) resistant common waterhemp with different systems and herbicide rates in LibertyLink soybean in SE Minnesota in 2016. 2016 Demonstration of the herbicide components in dicamba soybean, PRE plus POST and POST only applied at 3 and 6 inch weed at Rochester, MN. 2016 Evaluation of Enlist Duo for control of broadleaf weeds in soybeans at Rochester, MN. 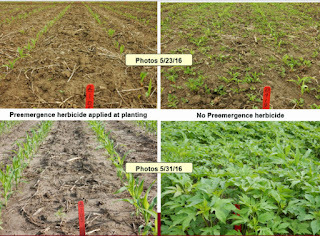 Evaluation of difficult to control broadleaf weeds with an HPPD herbicide based program in soybean in SE Minnesota in 2016. Figure 5. Comparison of Boundary (5,15) applied PRE followed by either POST Liberty (10) at 29 fl oz/a on June 8 or a mechanical cultivation on June 21 for weed control and yield in soybean, 2016. Click to enlarge. When developing weed management strategies and plans, it is important to add non-chemical control options to the weed control plan. These could include practices such as delayed planting, additional tillage, row cultivation, hand rogueing and cover crops. To demonstrate this, mechanical cultivation was evaluated in 2016. The trial compared a preemergence application of Boundary at 1.95 pt/a followed by either Liberty at 29 fl oz/a or by a mechanical cultivation. 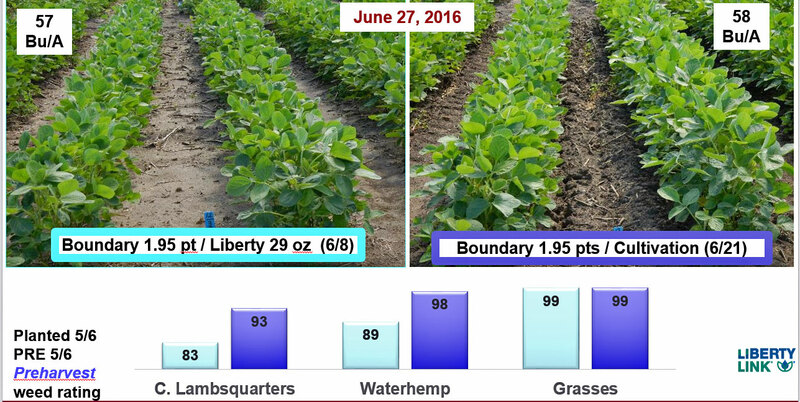 Final waterhemp control was significantly better with the Boundary/Cultivation treatment (98%) compared to the Boundary/Liberty program at 89% (Figure 5). The soybean canopy also closed sooner where cultivation occurred, so waterhemp that emerged under the canopy in July after cultivation did not survive. In addition, soybean yield of each treatment was similar and equal to the top yielding treatment in this trial. The Boundary/Cultivation treatment was also evaluated in 2015 with similar results for weed control, canopy closure and final yield. Managing glyphosate resistant common waterhemp with different systems and herbicide rates in LibertyLink soybean in SE Minnesota in 2015.